After a stressful 2012 that didn’t leave me nearly as much time to play as I would’ve liked to, my NYE resolutions were something like this: Play more, create more, go on more holidays and – oh, write a blog about all of these things. So here we are – welcome to my brand spanking new shiny blog. As it happens, snow is one of my favourite things. In the world. Ever. And on a cold winter’s day in an otherwise grey London, we woke up to a thin layer of fluffy white stuff! Needless to say, I was out the bed and in my wellies faster than you can say ‘excited’. Several hours, snowball fights and a cup of tea later we sat by the bedroom window, marvelling at the result of a brilliant day. Make snowballs. Lots of them. 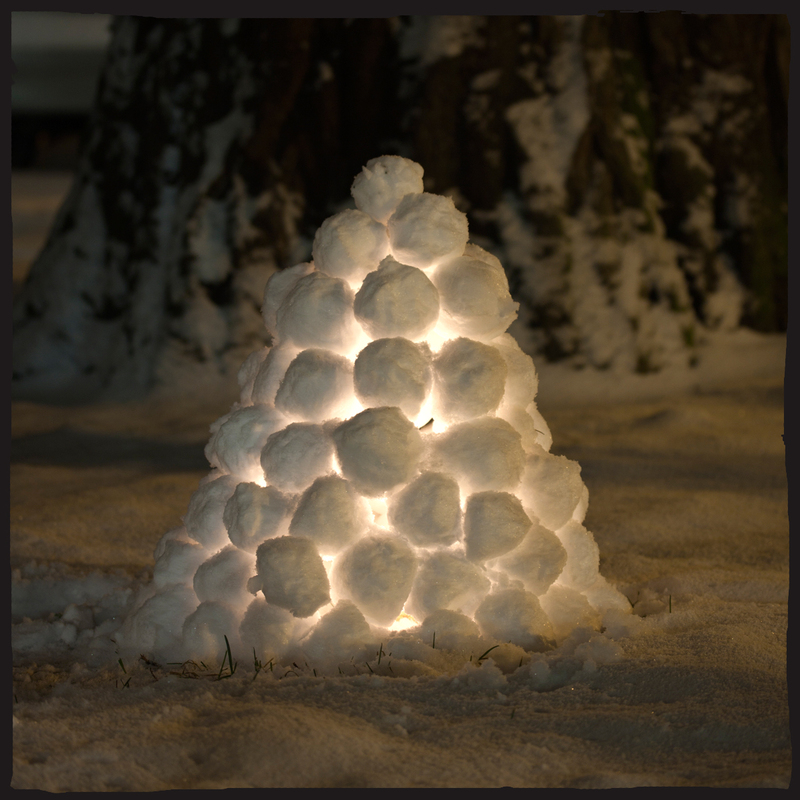 Choose a candle – it doesn’t need to be big, a tea light is enough for a small snow pyramid. I like to use candles that are in a container, my favourite kind are the ones that have a lid to protect the flame from falling snow and wind. Find a space where your pyramid will be seen and appreciated (preferably out of reach of small children and furry animals). Lay down a circle of snowballs of roughly half a metre diameter. You can make this smaller or bigger if you’re really ambitious, just remember – the smaller the pyramid, the smaller the candle needs to be or it’ll melt the snowballs and collapse sooner than you’d like. Lay the second row on the first, slightly slanting inwards. Continue laying your snowballs with each consecutive ring slightly smaller than the last, until you have just enough room to reach inside the pyramid to place the lit candle. Finish laying the snowballs in the same fashion as before, placing your final snowball right on top. Then stand back and enjoy.